Some worker-training programs take days to imbue in new employees the corporate culture and best practices. But after just 15 minutes under the spell of a virtual-reality headset and spiffy VR program created by Northern Liberties "experiential video" shop Klip Collective, new hires at the Philadelphia-based Honeygrow fast-casual dining chain are already feeling the company spirit. They're connecting with its "HG Engine" best-practices philosophy. Learning food-prep techniques. Practically tasting the dishes. So they're instantly energized, eager to dive into the work themselves, said company executives. "Our goal was to provide a consistent yet unique onboarding and initial training experience for all employees, regardless of geographic location or who the individual performing the training would be," Justin Rosenberg, Honeygrow's founder and CEO, said Wednesday. "Klip has really impressed us with taking our ideas and exceeding our expectations by making them a reality." Back in the early, local-only days of his salad and stir-fry emporiums — the first location on 16th Street between Sansom and Chestnut opened "exactly five years ago this Thursday" — Rosenberg could afford to be very hands-on. He would personally welcome all new employees and immerse them in the ways of Honeygrow — an upscale fast-food alternative obsessed with personalized orders, fresh ingredients, fast turnaround, and hospitable treatment of guests. But all that is getting harder to do as the privately owned chain expands. Seventeen Honeygrow locations now stretch south to Washington and north to Brooklyn. More are coming to Boston, Pittsburgh, Chicago, and Manhattan — the latter "our first, smaller-footprint Minigrow," said Rosenberg. "By the end of the year, we'll be up to 25 locations." Enter the VR training solution, as executed by Klip Collective. It's an idea (just dubbed "brilliant" by Entrepreneur magazine) that first started brewing when Rosenberg "got a Google Cardboard with my Sunday Times and I thought, 'What can I do with this?' " The answer: a VR experience that allows Rosenberg and team to warm up trainees virtually, "with much better focus than reading a written manual would have, and with more consistency than a local manager would, if having a bad day." The VR experience "also is being used for recruitment, to interest potential job applicants. And it impresses our guests, when they walk in and see employees doing it." Said Klip Collective cofounder Ricardo Rivera: "When a new hire puts on the VR headset and presses the start button on the remote, Justin materializes in our virtual-3D Honeygrow restaurant to share welcoming remarks and philosophy — how Honeygrow is all about thinking differently, bringing people together over high-quality, wholesome, simple foods. "Then we offer an interactive tour of a Honeygrow that gives a good feel for how and why things are done, with a casual video game at the end that's meant to be both fun and instructive," Rivera said. No stranger to integrating tech into the operation — as new hires (virtually) discover — Honeygrow locations also feature a custom variation on the classic split-flap railroad-station sign that communicates the news when customer orders are done. Restaurant touchscreens take a page from the Wawa customer ordering system, though Honeygrow dresses its models with special screen savers — still images and videos of neighborhood locations — that are "a love letter to every market we go into," said Jen Dennis, chief brand officer. In that game component of the VR experience, participants learn-by-doing how food is best stored on refrigerator shelves for health safety (fish on top, beef below, then pork and chicken on the bottom shelves). "We're finding this gamification really helps people grasp and retain information,´ said Dennis. 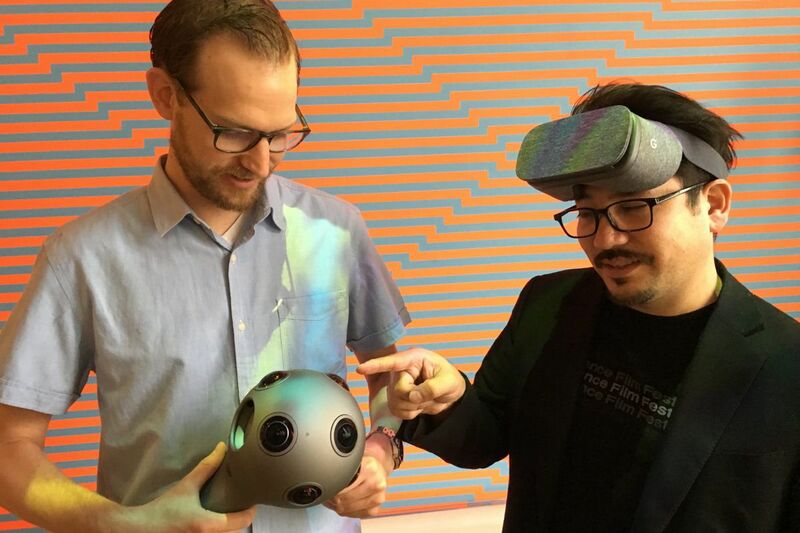 So more will be built into the next phase, "Honeygrow VR 2.0," said Kevin Ritchie, a post-production wizard at Klip Collective's sister company, Monogram. "Given the ever-improving state of the technology, anything you do in VR is a work in progress. When we first got started on the project, we thought it would run on Samsung Galaxy smartphones and Gear VR glasses. Then the Google Daydream-ready phones and companion goggles came out and were so much better in terms of screen resolution and processing power. The new Google Pixel phones don't overheat, as was happening with the Galaxys." How about mixing VR with AR, augmented reality, which would allow trainees to do "hands-on" food prep with a superimposed timer and graphic arrows pointing them in the right directions? "A nice idea, but the tech is not there yet." For the sake of "future-proofing," Klip Collective lights its sets (in this case, the Honeygrow restaurant in Cherry Hill) like a Hollywood film production, shoots VR with an ultra-high-definition $55,000 Nokia VR camera, and processes the footage on a server system so powerful that it could run an automated car factory. "If you want to convince VR viewers they're really in the moment, you can't afford to cut corners," said Ritchie.